If you were following the Gallery last year, you know that I showcased a series of stupid billboards scattered on Interstate 30 northeast of Dallas. 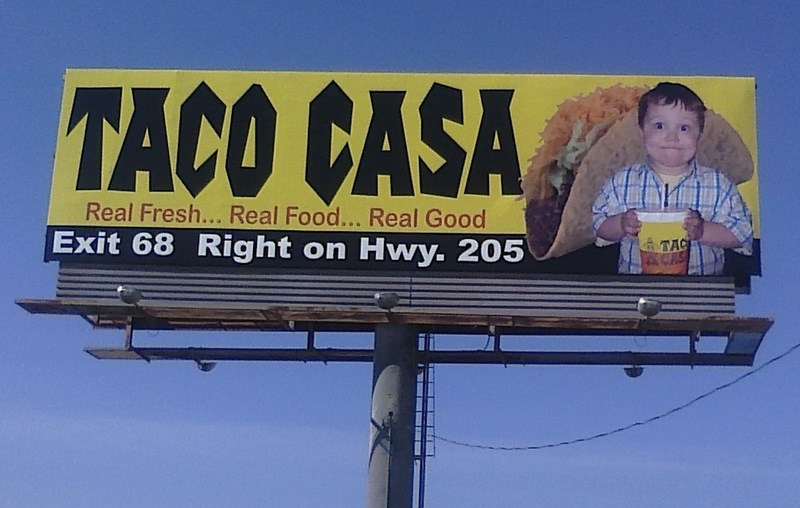 One of those was an advertisement for Taco Casa and featured a chubby boy with what looked like a chronic case of constipation. Recently the franchise put up another billboard along I-30 with the same picture. 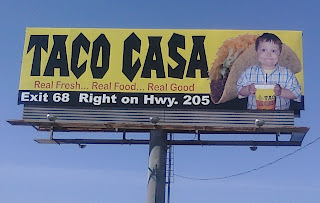 This time, however, they placed an image of a taco directly behind the kid, thus underscoring the boy's debilitating dietary choices. I guess the giant sugary drink in his hands wasn't convincing enough. The drink looks like a healthy choice. This is LOL funny. No need to down such a great company, owned by wonderful people, and for your information, their food is more healthy than the food you prob put on your table every night. Get another day job, because making fun of a little boy is just pethetic. What is a good way to contact you? I know the child in the picture, thanks. Also i'm not trying to defend him, I just want you to know more.